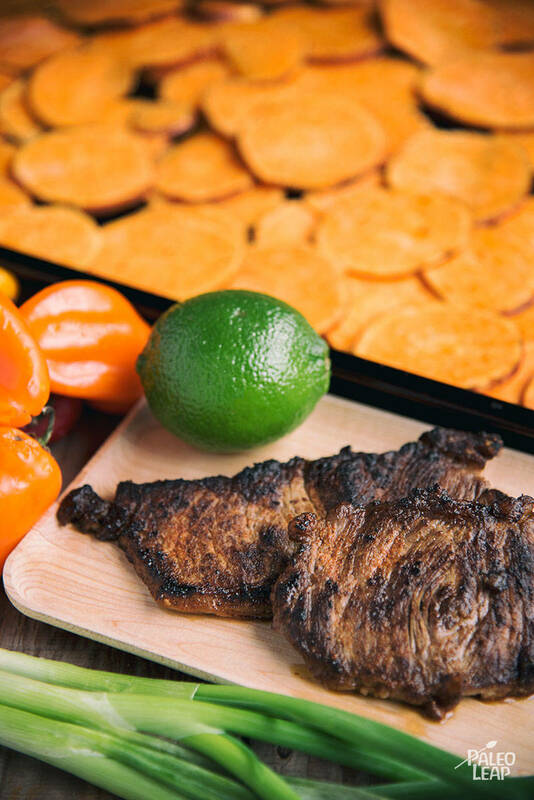 Steak over nachos might not seem like a Paleo recipe at first glance, but look a little bit closer. The ingredients in this dish, while reminiscent of stadium nachos, provide a healthy and fulfilling alternative. 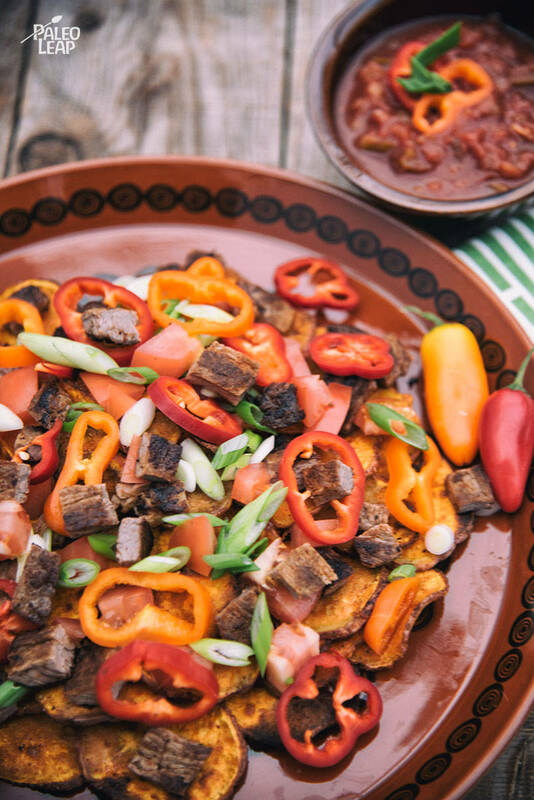 This dish uses sliced sweet potatoes as “nachos” and tops them with steak that’s been seasoned with delicious spices. This is a crowd-pleasing, kid-friendly recipe that works well as a party snack, appetizer, or a fun main course. The sweet potatoes used in this recipe are a wonderful substitute for the non-Paleo, starchy items that are typically used in Mexican-inspired foods. They provide the dish a healthy dose of nutrients, including Vitamins C and B6, fiber, and antioxidants, and they taste fantastic too! During prep, there’s no need to skin the sweet potatoes – just make sure to discard the “twists” at the end to prevent burning during baking. This dish should be served with a salsa. While a quick option is to opt for store-bought, consider making a homemade avocado salsa for a fresh, healthy choice. If you are serving this dish as a main course, pair it with some other Mexican-inspired recipes for a complete meal. Try the Spinach, Strawberry, and Avocado Salad for a fruity complement to the spice of this dish. Or, follow-up your meal with a Mango, Avocado, and Spinach Smoothie for a sweet and robust Paleo dessert. In bowl bowl combine the sweet potatoes and olive oil; sprinkle with paprika and season to taste. Lay the sweet potatoes on a baking sheet and bake 20 to 25 minutes, turning once. Season the steaks with the taco seasoning. Melt some cooking fat (about 1 tbsp.) in a skillet over medium-high heat. Add the steaks to the skillet and cook until desired, about 2 to 3 minutes per side for medium. Cut the steaks into bite-size pieces and set aside. Layer the steak, diced tomato, bell pepper, and green onion, on top of the cooked sweet potatoes on the baking sheet. Place in the oven and bake another 5 to 8 minutes, serve with fresh salsa and lime wedges.